The Nike shoes that get the most attention from sneaker fanatics and industry onlookers tend to be the high-priced sort. The Air VaporMax, for example, sells on Nike’s site for around $190, depending on the model. The Epic React and AirMax 270 both clock in at a slightly more accessible $150. More recently there was the AirMax 720, which has a price tag of $180, while Nike’s most hyped recent release has been the Adapt BB, a $350 smart shoe. But these sneakers, important as they may be to Nike, are just part of its business. It also sells many more basic shoes in the sub-$100 range, and in the coming months, Nike says it’s planning a refresh of the category, bringing in more innovation and creating more distinctive products. “Specifically, for next fiscal year, we’ve fast-tracked new collections under the $100 price point and we’re aligning the merchandising and marketing teams to support them throughout the marketplace,” CEO Mark Parker said on a call with analysts yesterday (March 21). Each year NPD tallies the top sneakers in US wholesale, and in both 2017 and 2018, the biggest seller was the Nike Tanjun, which costs about $65. A few other basic Nike models also made last year’s list. “We have about three quarters of our product at the core level, and footwear is going to be refreshed starting in back-to-school,” Parker said on the call, referring to one of the most important seasons for the sneaker industry. Nike is undoubtedly hoping these new collections will further fuel the turnaround it has been engineering in its North American business. In the quarter (pdf) Nike just reported, its North American sneaker sales recorded their strongest growth in years, driven by Nike’s new platforms—though overall growth in the region was lower than analysts had expected. Nike’s ambitions in the under-$100 category may be more about differentiating its shoes from the crowded market than packing in performance. “The consumer under $100 is looking for quality, less technical shoes,” says Matt Powell, NPD’s vice president and a sports industry analyst. 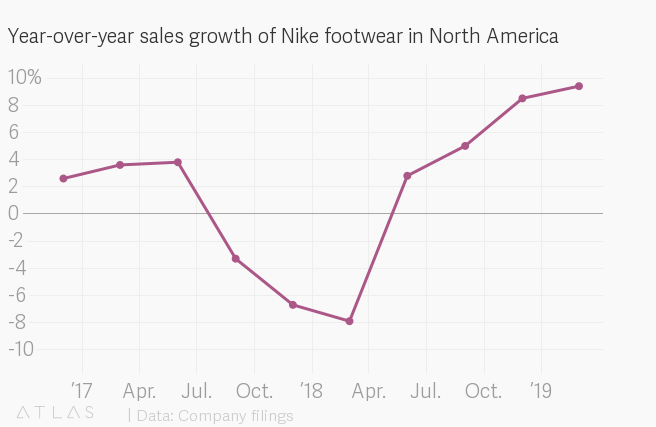 And at this point, most people in the US buying athletic shoes aren’t wearing them to do anything athletic anyway.